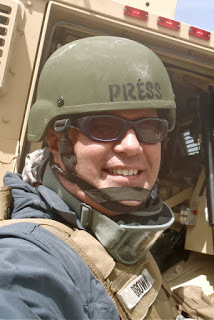 Randy Brown embedded with his former Iowa Army National Guard unit as a civilian journalist in Afghanistan, May-June 2011. He authored the poetry collection "Welcome to FOB Haiku: War Poems from Inside the Wire" (Middle West Press, 2015). His essays, journalism, and poetry have appeared widely both on-line and in print. As "Charlie Sherpa," he writes about military culture at: www.redbullrising.com, and about military writing at: www.aimingcircle.com. Note to broadcasters: Acronym "FOB" is pronounced "fawb"; rhymes with "Bob." In 2010, Randy Brown was preparing for deployment to Eastern Afghanistan as a member of the Iowa Army National Guard’s 2nd Brigade Combat Team (B.C.T. ), 34th Infantry “Red Bull” Division. Since its organization in 1917, the division has historically comprised citizen-soldiers from Minnesota, Iowa, North and South Dakota, and other Midwestern states. In news reports, the 2010 deployment of more than 3,000 was billed as the largest activation of Iowa troops since World War II. After a paperwork SNAFU dropped Brown from the list, he retired with 20 years of military service and a previous overseas deployment. He then went to Afghanistan anyway, embedding with Iowa’s Red Bull units as a civilian journalist in May-June 2011. A former editor of community and metro newspapers, as well as national trade and consumer magazines, he is now a freelance writer based in Central Iowa. He writes about military culture at: www.redbullrising.com, and about military writing at: www.aimingcircle.com. Brown is the author of the award-winning poetry collection "Welcome to FOB Haiku: War Poems from Inside the Wire" (2015), and the editor of the non-fiction title "Reporting for Duty: U.S. Citizen-Soldier Journalism from the Afghan Surge, 2010-2011" (2016). Brown was the 2015 winner of the inaugural Madigan Award for humorous military-themed writing, presented by Negative Capability Press, Mobile, Ala. He was the 2012 winner of the Military Reporters and Editors’ (M.R.E.) independent-blogging category, and was a finalist in the Milblogging.com awards’ veteran (2011) and reporter (2012) categories. He is the current poetry editor at the literary journal As You Were, published twice a year by the non-profit Military Experience & the Arts. He is also a member of Military Reporters & Editors, the Military Writers Guild, and the Military Writers Society of America. For a full listing of published credits, awards, and past speaking events, click here.